Why Is The Toyota CH-R Struggling To Sell In The US? Toyota’s trendy sub-compact crossover is a huge hit in Europe and Japan. So why not in America? Launched last year, Toyota was banking on the CH-R to be a huge sales hit. But while the is selling extremely well in Europe and Japan, it’s a decidedly different story in the US, as sales have fallen significantly short of Toyota’s high expectations. The automaker expected to sell 5,000 C-HRs every month after it launched in the US, but this has yet to happen. So far, its best-selling month was in February this year with 4,420 cars sold, thanks to better supply from the factory and new financial incentives. The sub-compact SUV is still facing an uphill battle however, sitting seventh in its segment this year behind the Mitsubishi Outlander Sport. “We’re fine with where the C-HR is. We’re pretty pleased,” Bill Fay, senior VP of automotive operations for Toyota Motor North America told Automotive News. Fay also argued that the C-HR is still a brand-new model that’s been out for less than a year and is still gaining sales momentum. “We had to build up some awareness and purchase intention for a new model.” Auto analysts, however, believe that the C-HR is struggling to sell Stateside because it wasn’t originally designed as a Toyota. 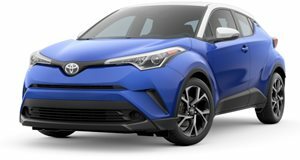 In the US, the C-HR was going to be branded as a Scion before Toyota pulled the plug on the brand in 2016. While Toyotas usually have a wide choice of trim levels, powertrains and options for different budgets, the Scions were sold with almost no options. It's a product that was intended for the Scion brand, and that means they made product-planning decisions relative to the kind of content based on the Scion mono-spec approach," said Stephanie Brinley, a senior analyst at IHS Markit. Another issue is that small crossover buyers usually require all-wheel drive, creature comforts, and minimal performance levels. Conversely, the North American C-HR is only sold with front-wheel drive. There’s no navigation option for the infotainment system, no leather seats, no premium sound system, no Apple CarPlay or Android Auto integration, and no engine options. The only powertrain option in North America is a 2.0-liter four-cylinder unit with 144 hp and a CVT gearbox. It’s underwhelming and doesn’t match the crossover’s bold styling. It also seems like a missed opportunity considering that the C-HR rides on Toyota’s new global platform, which focuses on engaging handling. "Looks are in the eye of the beholder," said Brinley. "Some people like it, and some people won't. A stronger powertrain could be a helpful thing."